This Light Award is sponsored by Benefits of Brainwave Entrainment and processed through Kiva.org. Vicente Guizzagan is 50 years old and resides in Barangay Estefania Amulung, Cagayan, in the Philippines. He is happily married and blessed with five loving children: Rovida, 31 years old and married; Reyfel, 27 years old and a graduate of an automotive course; Rexon, 17 years old and studying criminology; Rochavin, 12 years old and a sixth grade pupil; and Rovie, 10 years old and a fourth grade pupil. 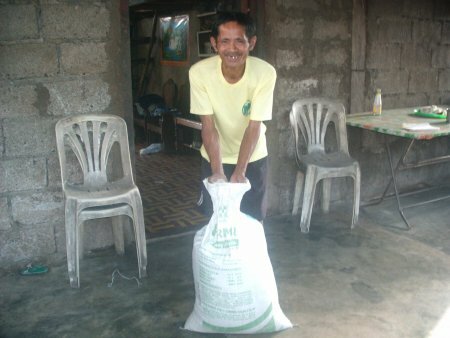 Vicente sells rice. His wife is a local vendor who sells different kinds of fruits and vegetables in their village. Since his wife does not have regular work, he started his own business as another source of income. Together they are helping one another to provide for their basic needs. Vicente wants to improve his business; consequently, he is asking to borrow PHP 7,000 from Kiva lenders. He plans to use the money to buy several sacks of rice and other commodities that he can offer to his customers.